The Swift Training Station after painting. 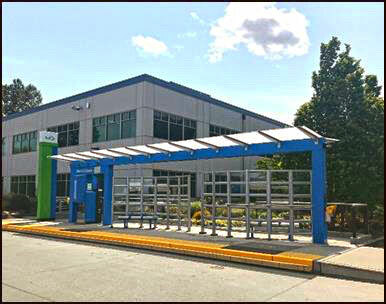 Photo courtesy of Community Transit. Washington’s first bus rapid transit line has been operating between Everett and Shoreline for more than eight years, and it’s time for a fresh coat of paint! The project should be completed in September when Community Transit will increase service on the Swift Blue Line. Between 6:00 am and 7:00 pm weekdays, Swift buses will arrive every ten minutes. That’s a 20 percent increase in service during those hours. The increase restores service to pre-recession levels and prepares for the launch of the Swift Green Line, which will connect the Boeing/Paine Field area with Canyon Park/Bothell through Mill Creek and south Everett. When the Swift Green Line opens in spring 2019, it will intersect with the Swift Blue Line at Hwy. 99 and Airport Rd., providing connections to a Swift bus every ten minutes along two of south Snohomish County’s most heavily congested corridors.